Photo of Koko boutique in Paris. An example of a carefully edited collection which I hope I'll do the same with my closet. It has taken 25 years of experimenting to understand my sartorial needs. After spending hours culling my biggish wardrobe 4 years ago, I have no desire to return to the enormous clutter that drove me crazy. I think I only ever wore no more than 25% of my wardrobe. Ditto for the handbags and shoes. What an absolute waste of money and closet space. I've come to the realization that I need to consider these 5 factors before I part with my cash. As I've said before, it only took me a quarter of a century to gain this teeny weeny bit of wisdom. Who knows what I can achieve in another 25 years at the rate I'm going? I don't follow trends per se. I dress to the beat of my own drum. Or in this case, the shape of my body. I have an apple shaped figure. Mid to high rise creates a smooth silhouette which also allows me to tuck in my jiggly bits. I've learned to hide the flaw by tucking a little of the hem of my tops into the waistband and letting the rest hang naturally. Well, my only consolation for an apple figured person is that I have slim legs. However, I'm no spring chicken so there's no way I will wear super short mini dress. I've learned to raise my arm to see how far the hem goes up. I'd rather not get slapped with an indecent exposure charge by the police. Unless I look like Kate Moss. In that case, shorter, baby! I've made enough mistakes with buying clothes because they're 1) cheap 2) heavily discounted 3) gorgeous. I'm a work from home mom with nary a glamorous party invitation in sight. Fancy dresses with super high heels are not part of my lifestyle. So I invest (I use the word loosely because most clothes do not ever appreciate in price) in beautifully cut jackets and coats to jazz up my otherwise basic wardrobe of simple tees, sweaters and dresses. I deal with kids all day so my outfits have to be unfussy, comfortable, hopefully chic and easy to wash and dry. I have a budget which I stick to. I'd much rather have savings in my bank account than thousands of pounds in clothes and shoes. However, I would sooner have one good quality jacket than 6 badly fitted ones which I inevitably will chuck out. Unless it's a rare piece which will never ever go on sale, I stalk the item until hopefully, the price drops to a satisfactory digit. I detest clutter. I prefer to have a small wardrobe with clothes that I can easily mix and match without much effort. I'm a busy working mom. I don't have the luxury to try on infinite outfits before settling on one after the alarm bells go off. I have 5 minutes to put my clothes on. Each new item has to work with the existing wardrobe to create multiple outfits. I can't be what I'm not. I've never been a girly girl. I mean this is a girl that HER male Taekwon-Do instructor had to give an hour long lesson on how to walk like a girl. Lesson two: A pat on the shoulder does not require force. So, yeah, I don't do florals very well. I feel most comfortable in pants. I've only started to wear dresses 3 years ago but anything that requires more than 2 minutes to slip on is considered a waste of time. Hope you had fun at the H sales. thank you for this great post!!! so many great tips i often forget when caught in the moment of shopping. sometimes it's really hard to think practically when u find a super great deal! Love this post! I am in the process of "rebuilding" my wardrobe as well. I got rid of all the unwanted clothing that was just sitting there and gathering dust. If anything, it was quite therapeutical. 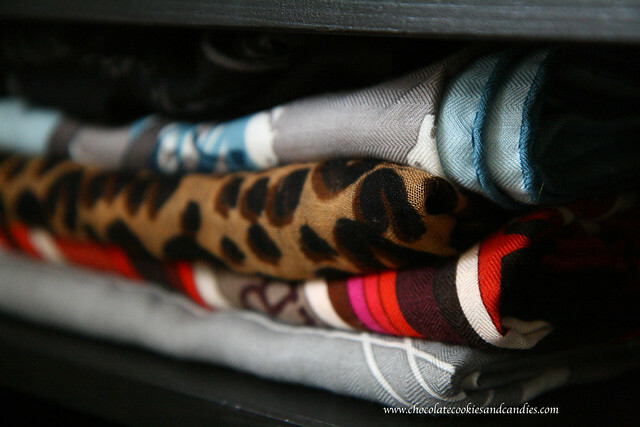 I love the concept of a capsule wardrobe. Absolutely love this post, I feel the same way about most of of your points (we do differ in that I wear super minis lol, I don't mind flashing others a bit, and I'm quite girly). I was actually weeding my closet yesterday and I had a huge amount of old sweaters just sitting there cluttering my space. How many sweaters a person needs? I kept just a few favorites and the rest are in the donations bin. I hate clutter. This is a great post, I'm going to save it and read it before any new purchases are made. I'm an apple too, though I'm a slim apple after losing 45lbs, that flipping midsection just didn't go! I wish I could still wear shorts skirts, when I was overweight I wore mini skirts and big jackets all the time. This is an awesome post Marlene, it spoke to me in many ways. All these points you brought up are great reminders of what one should keep in mind when purchasing. I can't tell you how many times I made the same damn mistake by getting carried away in the moment of buying good looking stuff that weren't practical for everyday use simply because they were cheap. I learn my lesson year after year by throwing stuff away and can finally say with pride that I take more time to think before shelling out my money and invest in higher quality items. One can't go wrong with the "Less is more" statement, I have begun to appreciate the minimalist concept. Love this and I think I've been on a parallel journey with you! It's so freeing! Like the other lovely ladies here - I loved reading this post!! We're building a new house and this year HAS to be about thinking - before buying.... This post is great when trying to stay on this path. Thank you for sharing these great thoughts with us! Thank you for your lovely comment! I don't think you can go wrong with a Chanel PST. I has been in fashion for nearly a decade. It's an absolutely stunning and classic bag. Wow, a mom of 3?! I can imagine how busy you are. Likewise, it has taken me so long to get to this point too. Marlene! I love this! Thank you so much! Really, I hope my closet can be as well edited as yours soon. When you got rid of most of your items, did you donate them or sell them? I really want to do a closet overhaul so I don't feel so cluttered. Sam, I'm so glad you like this post. To be honest with you, it's more of me thinking out loud. I donated to a a couple of charity shops in my neighborhood. The designer items are either sold on eBay or consignment shops. That's the reason why I only specialize in accessories. I'm terrible at selling clothes. It was such a relief to empty out 3/4 of my wardrobe. In fact, I was amazed to discover how many were unworn! You crystallise the wardrobe lessons I should have learnt . Just wish I could live by this. In my younger days I did live like this , I only bought one or two expensive things. What happened ? I can't resist a new cashmere in a yummy colour, a bargain , a new pair of jeans, a new Anne Fontaine shirt . Let alone Hermes ! Estrella, I think it's the fear of clutter that kept my armor of self restraint on. Sales are really dangerous. I've gone overboard before and now, I've learned my lesson. Very well thought out plus a timely reminder for me to know who I really am and thus what do I really need. Like you, I must have durable, washable, affordable and comfortable clothing and though I gaze longingly at Vivienne's selections, a Stella McCartney pencil skirt won't ever tick the above boxes (versatile, yes!). 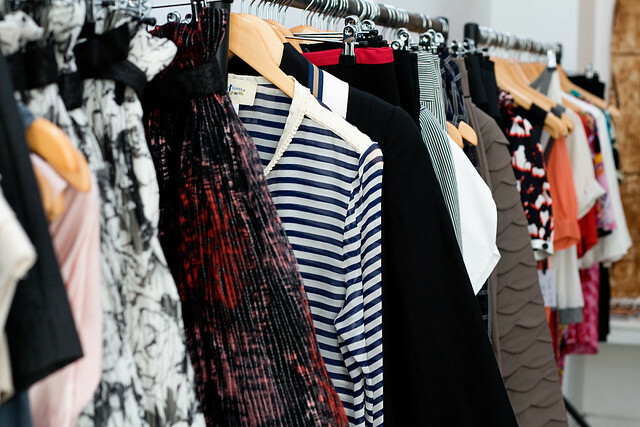 However, you're so right: better to have a skinny wardrobe that earns its keep. 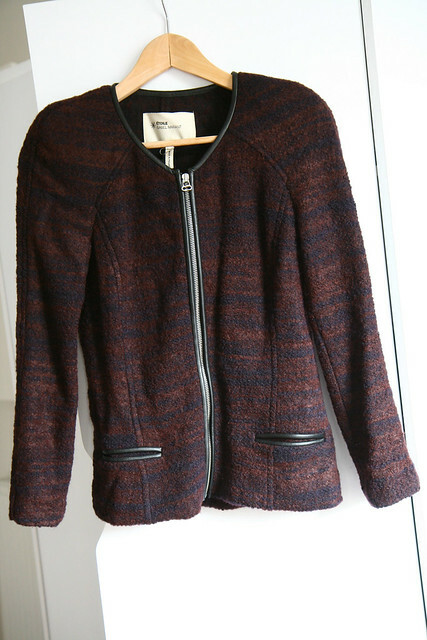 Love your Isabel Marant jackets - which I don't need ;) - they wouldn't suit an hourglassy shape anyway. I just continue to quest for the equivalent special piece for my figure. Currently I search endlessly and hopelessly for that outer garment which would pull it all together. I so rarely shop and when I do venture forth, get overwhelmed by what's out there and beat a hasty retreat back to Hicksville (where the zipped fleece jacket is high end fashion). A great post, wish I could follow this, however, I've stopped buying clothes that don't fit me perfectly just because it's a bargain unlike before.. Do need to declutter now though! I've edited my wardrobe already twice in the past couple of years. Now, when I look at my dressing room again, I think it's time for another edit, though not as drastic as before. Having said that, I always dressed for my personality, lifestyle and shape, it's just that styles and taste change; hence, the editing. I used to just give all my unwanted clothes away, but now I also make a "Sophie when she's older vintage box." Maybe my daughter can wear some of my clothes when she's older ... if not, she can donate them too. What a lovely post. It really inspires me to write a post like this. You certainly have this wardrobe development thing down:) I love wardrobe editing. "I would sooner have one good quality jacket than 6 badly fitted ones which I inevitably will chuck out." I agree with this completely. I'm always drawn to items that are made well and willing to spend more on them. Items that flatter the figure are key. Once you figure that out it's so much easier to build a wardrobe. Oh, this was such a refreshing and good read. Haha, and you're so witty! I like the no. 5, and I guess it's one of the most crucial aspects when it comes to wardrobe building and finding your own style. I have never been a girly girl though I'm obsessed with skincare/beauty/hair etc, but my inner tomboy is stronger than my interest for girly stuff.. so I dress accordingly. I tried buying beautiful jackets from IM to jazz up my outfits as well, but they were too girly for me. So.. I'm glad they work for you because you sure have an amazing collection of well-cut jackets! Really enjoyed reading this! I'm in the midst of moving homes and some of these points totally resonate with me. Trying to pack is driving me up the wall, in a "why do I have so much stuff!?" kind of way. I've already donated so much of my stuff to Salvos that I'm feeling well guilty about all the money I've spent on things I've hardly worn.. I'm going to take this move as an opportunity to do a massive edit! I've always enjoyed your blog and you style. I really enjoy your photo-log and your IM collection. I want to let you know I am giving you the Liebster Award which is for the support for bloggers who have less than 200 followers. This is such a great post!! Quality over quantity is something new I've been working on with my wardrobe. I've always taken that approach with handbags and shoes, but I've only recently started putting that same thought into my clothing. I have a problem resisting a good sale too. It's really a work in progress. 45lbs?! If you can do that, I think I can at least lose 10lbs. You're my inspiration. I'm sure you can still get away with a miniskirt.